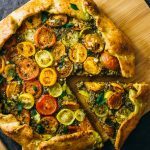 Here's a savory galette with pesto, heirloom tomatoes, and a parmesan crust. Prepare the crust dough: Add flour, parmesan cheese, butter, and salt to a food processor with a metal blade. Process until combined. Replace the metal blade with a dough attachment. Add water and process until the mixture clumps together and resembles dough. Form dough into a ball and cover with plastic wrap. Refrigerate for an hour to chill. Assemble the galette: On an oven-safe baking mat, roll out the dough into a rough circle about 12 inches in diameter. Evenly distribute the toppings, avoiding a 1 inch border. Start with the parmesan cheese then pesto then followed by tomatoes. Top with black pepper. Fold the border of the dough inwards around the edges of the galette. Combine egg and water to form an egg wash and brush the edges of the galette, discarding any leftover egg wash.
Bake and serve: Bake at 400 F until the crust is golden brown, about 30 minutes. Garnish with parsley, and let cool for 10 minutes before slicing and serving.